The most glorious wall calendar I ever saw. Every January I looked forward to buying a calendar for the New Year, displaying it like a work of art, shopping for an interesting theme customized to my taste. One year it was Welsh Corgis, another tropical beaches, wolves, 365 days in Italy and the list goes on. You can probably find a wall calendar designed to suit everyone on the planet. A recent Bing search turned up 141,000,000 results. Last year I didn’t bother to buy a calendar (relying on my mobile phone) and now I realize how much I miss turning the pages month by month. I need to replace the digital and repost the material version of my life day by day and take a clue from the Renaissance. The fresco artists of Italy’s quattrocento were masters at interpreting the months of the year and often used their art to bring attention to the passage of time and its implications. Fresco cycles with symbols and designs that represent the astrological horoscope and seasons can be found in the salons and halls of Italy’s most renown palazzi and villas. Many 15th century fresco artists interpreted the months of the year with such stunning results that their work is among the great art of the western world. The king of American food is the hamburger. You can find them in Italy but not as frequently and they definitely don’t taste the same. Americans talk with their mouths full. Eating in Italy is all about enjoying your food with proper digestion. Nothing is so important that it can’t wait to be said and nothing gained by not waiting. Americans eat way too much meat. Italians consume very little red meat. A small plate of some pasta followed by a small piece of chicken or fish with vegetables is typical to eat. The American view of eating “Italian” with heaping plates of spaghetti and meatballs swimming in red sauce is a caricaturized version of the Italian table. A typical Italian meal is a small plate of pasta and a small piece of protein. Like all traditional cultures Italians do celebrate special occasions with abundance but on a daily basis Italians prefer to eat small portions. Americans eat very fast. Italians eat at a leisurely pace and are better for it. Not only does eating slowly and mindfully help you eat less, it enhances the pleasure of the dining experience. Italians view dining as an experience. Planning, shopping, the preparation and cooking of the meal are as important as sitting down to eat. Italians find the size of a cup of coffee in America “too large” with way too many menu options. Store bought salad dressings are superfluous when you have good olive oil and balsamic. In case you’re wondering what American food tempted our Italian cousin’s palate the most well it was . . . Amish Fried Chicken and Country Ham, our hometown Donuts and Buffalo Wings! According to the cleaning mavens at Proctor and Gamble, Italian women spend 21 hours a week on household chores as opposed to Americans who spend just four. Italian women supposedly wash their kitchen and bathroom floors at least four times a week. American women just once. Some of our Italian relatives don’t have dishwashers, believing that hand-washing may be better. Perhaps even calming and therapeutic. Italians still hang their laundry out to dry and iron nearly all their wash, even socks and sheets. They don’t understand our obsession with plug in “air fresheners” and don’t believe that food odors are offensive. They open their windows to let the fresh air in even if they live in the cities. 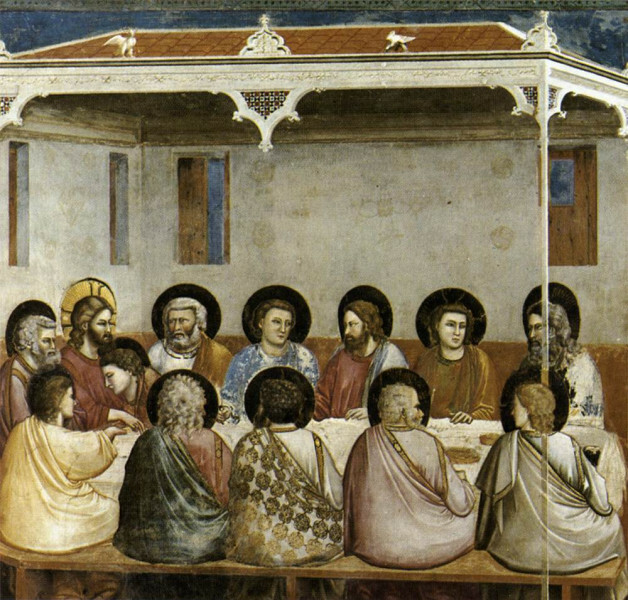 One of the most important fresco cycles in Italy is by the Italian Renaissance master Giotto located in a chapel on the estate grounds of a money lenders son who in atonement for his father’s sins sought redemption through art. Reginaldo Scrovegni was a wealthy moneylender from the city of Padua. His reputation was such that he was portrayed in the Seventh Circle of Hell in Dante’s Divine Comedy. It’s no wonder that Enrico Scrovegni, Reginaldo’s son, felt compelled to build a private chapel next to the family palazzo in penitence for his father’s sins. He must have been frightened out of his mind after reading Dante’s description of his impending doom and hoped not only to atone for the sins of his father but his own as it was suggested that Enrico was also involved in usurious practices. So Enrico commissioned Giotto to design a chapel with a series of frescoes on the site of a Roman arena that was on the grounds of his family estate. Send a special message to the women in your life today. March 8th is International Women’s Day. In Italy they celebrate Festa della donna (Festival of the Woman) with banners and yellow mimosa. This time of the year, traveling in Italy, I noticed hundreds of bouquets of mimosa and banners everywhere. The Italians have always valued women and their role in society. Italy is like a great caldron of sensuality and emotion. History and art are sprinkled in for good measure and the outcome allows creativity to flourish and for women it allows their special talents to emerge. If the number of yellow-flowered mimosa I have seen in Italy during March is any indication of the esteem Italy has for its women than I think they are greatly appreciated. The Italian language is very fond of suffix endings. A few letters added to the end of a word can expand the meaning of the word by degrees of smallness, largeness or extremes. Of course there are Italian words themselves that convey the same meaning as the modifying suffix but the economy of word usage by just slightly altering the ending of an Italian word is a fun way to express degrees or extremes. Some people use these nomi alterati frequently and others tend to use adjectives instead*. Sometimes these suffix endings are not acceptable substitutes for a descriptive adjective but when they are Italian “word changelings, the offspring of a noun or adjective with a modifying suffix, make the original word all the more melodious and sound so much better than their English counterpart. Italian word changelings intensify the meaning and when pronounced with the right inflection and tone make the Italian language that much more colorful and fun to speak. For example the following suffix ending – ino (a) used to indicate a diminutive form or smallness. *you can also use the word piccolo (a) to mean small or tiny. The word ending – one is used to indicate largeness.